Congrats! Today is the day. You’re off to the races! You’re off and away! Did you know that March 2 is Dr. Seuss’s Birthday? Because of this it’s also Read Across America Day! So we are celebrating with our Race to Rhyme-Ville 5K & 10K – They Said I’d Fail, They Said I’d Flop, But I Will Not, Will Not Ever Stop!We will also be donating at least 15% of each registration to DonorsChoose.org, an organization that makes it easy for anyone to help a classroom in need, moving us closer to a nation where students in every community have the tools and experiences they need for a great education. When: Complete your race any time during March 2019! If you can complete it on March 2, even better! 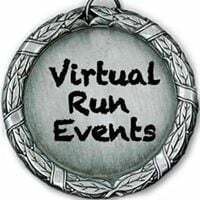 Why: Because we want as many people as we can get to virtually run (or walk) a 5K or 10K! Plus, we will be donating a portion of each registration fee (at least 15% of each registration) to DonorsChoose.org. *Medals will start shipping out mid-February. After that they will ship out within 2 to 5 days of signing up. Cost: $20. 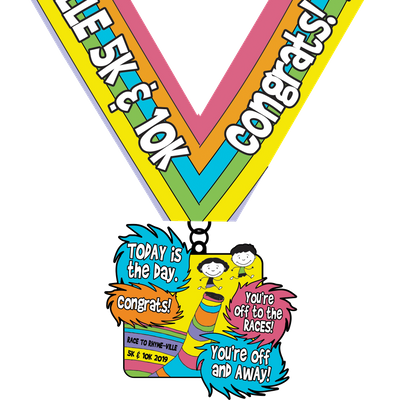 Includes custom medal and bib that will be shipped directly to you. Plus, at least 15% of every entry will be donated to DonorsChoose.org. *We are in no way affiliated with this charity, we like to choose a different charity for each of our races and are happy to raise funds for them.